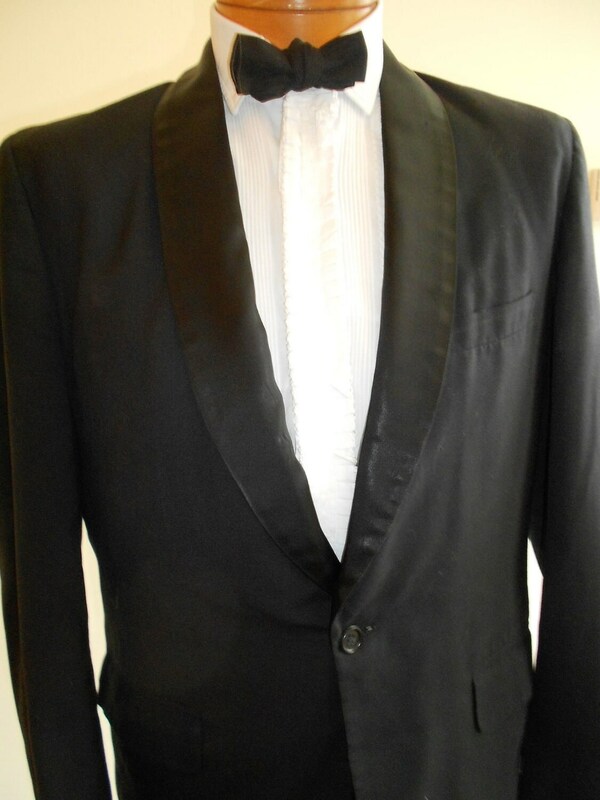 1960's, 42" chest, 36" waist, black tuxedo suit. Jacket of suit has a satin shall collar, with one single black plastic button fastening jacket at waist. There are two cuffed pockets at each hip, and a slash breast pocket, left. Shoulders are slightly padded, sleeves are straight and long, with two round, black plastic buttons at each wrist. Suit is a light weight blend of cotton and synthetic material. Jacket is fully lined in black acetate. Label reads "styled by Montemurro, Newark, N.J." Pants are flat fronted, with a front zipper, and a wide hook and eye atop zipper. Pant legs are long and straight, without cuffs. Band of black satin is down the outside of each leg. Slit side pockets at each hip, two plain pockets on each side in back. There are round plastic buttons placed around waistband for suspenders.